Notre Dame College of Arts and Letters alumni Brian Powers ’12 and Nicholas Gunty ’12 have a lot to be proud of after releasing a music video for the title track of their first album, Kandote. What they did with the proceeds from that compilation, however, is even better. The video from Frances Luke Accord is simple but powerful. This may be because Powers edited the whole thing himself or because the footage was shot during dusty days in Kkindu Village, Uganda. More likely, though, the video’s dynamism comes from the Ugandan school children who lend their haunting and beautiful voices to the song’s chorus. “Kandote,” which means “and I dream” in Luganda, is no normal song, and Powers and Gunty are not normal struggling musicians, either. While many aspiring artists would be concerned with their own future and financial sustainability, they used their first album to fund the education of 28 children in rural Africa. Native South Bend residents, Powers and Gunty met near the end of high school through mutual friends and each chose to attend Notre Dame, where Powers majored in sociology and Gunty in art. Both musicians, they played together on occasion and eventually formed Frances Luke Accord (Frances is the street that Powers lived on and Francis is his confirmation name; Luke is Gunty’s middle name, and “accord,” in this case, means “harmony”). The two began writing music and performing consistently, even opening for Girl Talk at Notre Dame’s 2011 B1 Block Party. At an open mic night at Fiddler’s Hearth in downtown South Bend, Kevin Dugan ’01, the founder of Fields of Growth International, an NGO that promotes global leadership development and service, approached the duo after their set. 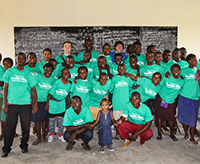 “That was the moment that Kevin pitched the idea of us going to Uganda and collaborating with a choir,” Gunty said. The choir was the Barefoot Truth’s Children’s Choir in Kkindu Village, and after much deliberation, the two decided to make the trip. Gunty wrote a grant and Powers fundraised online until they had enough money to pay their way. While they knew they wanted to create an album in collaboration with the choir, they did not yet know what it would sound like. They sent a CD of potential choruses for the children to learn beforehand, as they did not speak English well. With a field-recording rig in tow, Powers and Gunty traveled to Uganda over their winter break in December 2011. The first time they met the choir, they were greeted with humbling applause. They set about befriending the children and recording their singing over the next two weeks. “The kids were incredibly well-behaved and engaged. Working with them was a privilege,” Powers said. Their interactions with the choir members and their exposure to traditional Bagandan folk music greatly influenced the album-in-progress. “About half the album was pre-written but the (songs) that are much more meaningful are the ones that came about over there,” Gunty said. Upon their return to the United States, the duo finished the album. The result is a seven-track LP. 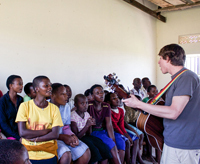 While in Uganda, Powers and Gunty realized the children who contributed to their songs were facing hardships that they themselves had never experienced. In fact, many of the children struggled to afford a basic education. They could not sit for their school exams and move on to the next grade-level unless they paid their school fees, which totaled just $70 a year. So Frances Luke Accord decided to use the proceeds from the sale of Kandote to pay for the education of members of the choir. They’ve gotten a good response, too. “We’ve made enough money to send all 28 members of the choir to school for two years,” Powers said. Along with the money, Powers and Gunty sent each of the children their own copy of Kandote. The only CD player in the village resides in the church. Both young men note that this isn’t just a case of Americans giving charity to Africans. On the contrary, it is an empowering collaboration. They hope to one day go back to the village, and they are continuing their musical collaboration. Gunty is completing a one-year Master of Arts program in Studio Art at Eastern Illinois University. From there, he hopes to move to Chicago. Powers is currently working for Notre Dame but is looking for employment in Chicago as well. “We’re both getting jobs for the purpose of sustaining ourselves, but music is our focus,” Powers said. The duo is hoping to promote the album through live performances in Chicago this summer and continue fundraising for members of the Barefoot Truth’s Children’s Choir. While the chorus of “Kandote” translates to, “and I dream of being one, together, for we are one blood,” this collaboration is no longer just a dream. Powers and Gunty made it a reality and profoundly changed the lives of 28 children in the process. For those interested in purchasing Kandote, you can find it at franceslukeaccord.com/music/ or on iTunes, Spotify, or Amazon. Originally published by Elle Metz at al.nd.edu on April 04, 2013.